Special Lebanese inspired lunch for my teacher Rima: tahini, hummus, lentils with fresh lemon juice, potatoes and artichoke hearts with fresh lemon juice and parsley. 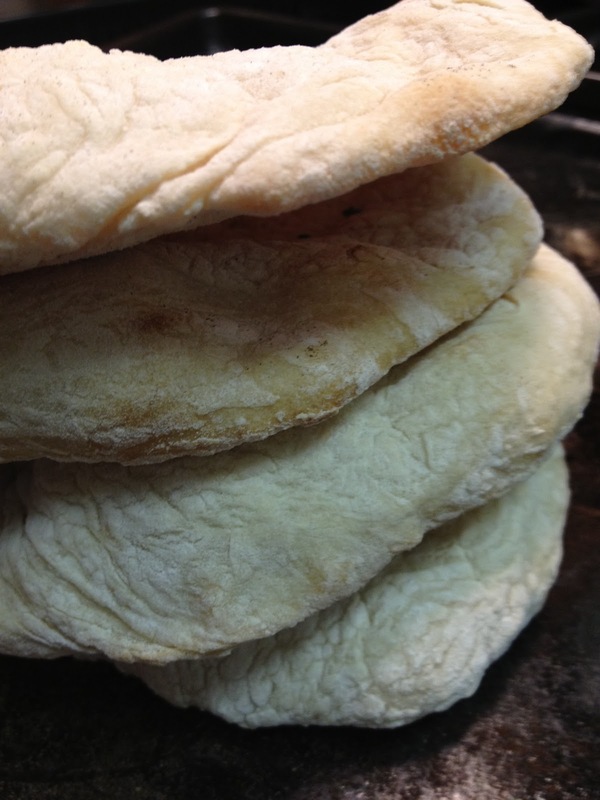 And of course, I had to make fresh pita bread to complete the mezze plates. Much easier than I thought and, of course, anything homemade is better! Sift flour and salt into a large bowl. Add the yeast water, 1 cup of warm water, olive oil and stir with a wooden spoon to combine. Knead dough for 10 or so minutes with a hand mixer fitted with dough hooks or a stand-up mixer until the dough is no longer sticking to the sides of the bowl. Coat a large bowl with olive oil and drop the dough in. Let it rise until it doubles in size, about 3 hours. Cut the dough into 12 sections, roll them into little balls, and place on a floured surface. Cover and let stand for another few minutes. Preheat oven to 500 and place the rack on the bottom of the oven. (I made these in my city kitchen, so I used a baking sheet. If I was at my house, I would have used my pizza stone.) Place the baking sheet in the oven to get hot. Roll out each ball into a flat circle, about 1/4 inch thick (approximately) and bake 4 at a time. They will start to puff up and get brown, a few minutes. Serve immediately or store. They are great heated up later!